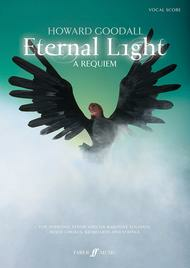 Eternal Light: A Requiem (Vocal Score). Composed by Howard Goodall. Choir Sacred. Choral (Sacred); Choral Worship Cantata; Larger Works; Score; Worship Resources. Faber Edition. Sacred. Vocal score. Published by Faber Music (AP.12-0571532306).ISBN 0571532306. Sacred.The writing of a Requiem is a special challenge for any composer. The great Requiems of the past by composers such as Mozart, Verdi and Berlioz interpret the sacred Requiem text literally, offering prayers of salvation for the departed, whose souls are assumed to be in purgatory facing a terrible judgement.Eternal Light: A Requiem, by the award-winning British composer and internationally acclaimed broadcaster Howard Goodall is a stunning new requiem for the modern day. In contrast it is intended to provide solace to the grieving, reflecting on the words of the Latin Mass by juxtaposing them with poems in English. Speaking about the work, Howard Goodall said "For me, a modern Requiem is one that acknowledges the unbearable loss and emptiness that accompanies the death of loved ones, a loss that is not easily ameliorated with platitudes about the joy awaiting us in the afterlife. This, like Brahms', is a Requiem for the living, addressing their suffering and endurance, a Requiem focussing on the consequences of interrupted lives. ".